You can take the girl out of New York, but you can’t take the New York out of the girl. And by that I mean my extreme love of pizza, bagels, and the like. Especially bagels. They were a favorite breakfast item of mine growing up and continued to remain that way up until my Celiac diagnosis. When I had to go gluten-free, there were a few gluten-free bagels out on the market…but nothing that was so close to being a real bagel that I had to continue to buy them. I was mightily unimpressed by most of the ones I tried. Until Udi’s. And then Katz Gluten Free. GLUTEN FREE CINNAMON RAISIN BAGELS!! Sold! They were popped into my shopping basket (they were on the list…just not this brand specifically) and I made my way to the register before I was tempted by more gluten-free goodies while out on my tight grocery budget. And with that, I was heading home with my new find from the freezer section. I tossed them into my freezer (they specifically say to keep frozen…unlike most of Schär’s products, which are shelf-stable) and let them sit there for a week because I made homemade Gluten-Free Pumpkin Cinnamon Rolls…and I was churning through those first. But I was craving a bagel and today felt like a good day for a bagel. After all…I had to go swimming this morning. If that doesn’t earn a bagel, I don’t know what does! So, this morning before heading to the pool, I took out the Schär Gluten Free Cinnamon Raisin Bagels and removed two of them, placing them in a giant Ziploc bag and letting them sit on the counter to thaw while I was swimming some laps. When I came home, I turned on my oven and prepped a baking sheet so I could get a toast on these bagels. I did see where it said they were best enjoyed without toasting and just at room temperature…but who doesn’t toast a bagel?! Hmm? That’s just inhuman! So…I went to take my shower as the oven preheated and upon stepping back into the kitchen, the oven was ready and I tossed the tray into the oven to let the bagels toast. I will point out that as I was preparing the bagels I made note of how they looked and felt. They are actually smaller than an average (New York-style) bagel, and more like the size of a doughnut. Instead of being bigger in diameter, however, they make up for it in height. Half of the bagel is nice and thin, the other half…is where you’ll find all the meatiness of the bagel…that chewy bread part that makes a bagel a bagel…toasted and crunchy on the outside with the chewy dense bread on the inside. And these bagels were definitely dense. They had a bit of heft to them, unlike Udi’s (still my favorite), where they feel quite light (which is a good thing!). The Schär Gluten Free Cinnamon Raisin Bagels did smell amazing while they were cooking. You could get that sweet scent of cinnamon as the bagels were toasting in my oven. Mmmm…I was anticipating them finishing up…and actually kept pulling the door open to check on them, hoping for a little bit of golden doneness on the surface. It took about 10 minutes to get there…but when they did, out they came. Each half got a light coating of Tofutti Better Than Cream Cheese (vegan cream cheese FTW!) and breakfast was served! I grabbed my coffee and my plate and tucked into the couch with my book (Heat by Bill Buford, if you were wondering) and settled in for my breakfast. First bite. Oh…yeah. There it was…that crispy outer crust with that chewy, soft inside. They were definitely denser than I like, but not bad. I rank them number three on my favorite gluten-free bagels (#1 – Udi’s; #2 – Katz Gluten Free). The cinnamon brought sweet heat that just elevated the flavor of the bagels. And the sweet raisins were a nice pairing. I had been craving cinnamon raisin…specifically in bagel form…and Schär delivered a solid, delicious version to me. I was impressed. I had a feeling it would be okay, as Schär has never let me down with one of their products, but you just never know. And being a bagel aficionado, I am rather particular about my bagels and how they feel, taste, and overall…how they cook. They have to live up to my high New Yorker standards. And these…basically did. Aside from being a little heavier than I like a bagel, they definitely delivered. And my craving has been satiated…finally. The Schär Gluten Free Cinnamon Raisin Bagels are made from water, corn starch, rice flour, buckwheat flour, sugar, yeast, psyllum seed husks (vegetable fiber), rice starch, canola oil, soy protein, cane sugar syrup, modified cellulose, salt, tartaric acid, calcium citrate, iron, thiamin, riboflavin and niacin. Yeah…those last few sound kind of chemically. I get that. But the Schär Gluten Free Cinnamon Raisin Bagels are gluten-free, wheat free, lactose free, egg free and diary free. They do, however, contain soy. A serving of Schär Gluten Free Cinnamon Raisin Bagels is 1 bagel. No shock there, I know. 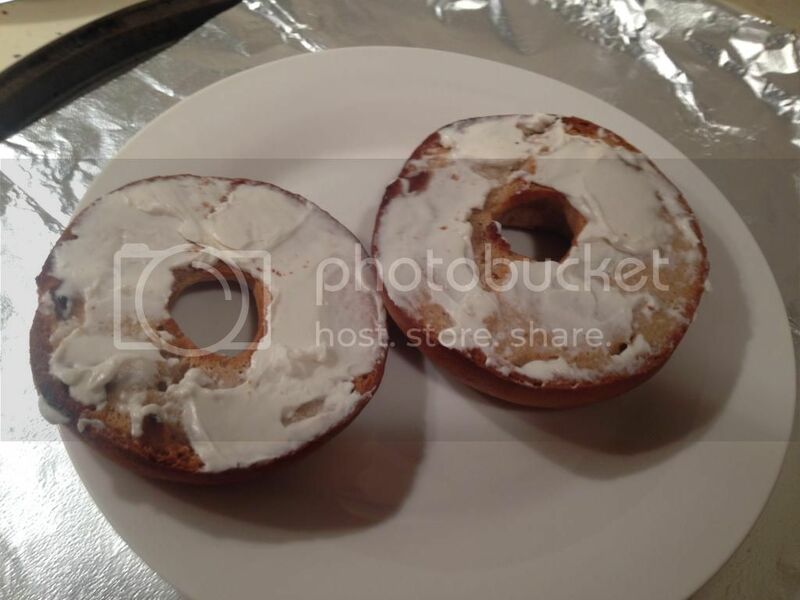 This one delicious bagel will serve you 250 calories and 3 grams of fat. That is epically good for bagels. Trust me. One bagel will also provide you with 600 mg sodium and 11 grams of sugar. Both of those are a little higher than I like…but, again, not terrible for a bagel. These bagels are cholesterol free. And, finally, you will be getting 6 grams of filling fiber and 3 grams of protein. You will definitely feel full after a bagel. And I didn’t burn right through it either. I remained feeling full for quite a few hours after. Loved that. I want to, once again, send out high praise, much deserved to Schär for their Gluten Free Cinnamon Raisin Bagels. Yet another amazing product to add to the lineup. I was beyond impressed with them. And, yes…the true test comes with whether I would shell out money to purchase them again. The answer is yes…oh, yes! This entry was posted in Bagels, Baked Goods, Bread, Breakfast, Entree, Food, Frozen, Gluten-Free, Products, Review, Snacks, Vegan, Vegetarian by The Celiathlete. Bookmark the permalink.